The International Consensus Conference for Advanced Breast Cancer (ABC) has established itself as the major international conference for advanced Breast Cancer. Its primary goal is the development of international consensus guidelines for the management of ABC patients. These guidelines are based on the most up-to-date evidence and can be used to guide treatment decision making in many different health care settings globally, with the necessary adaptations due to different access to care. The last meeting, which took place in Lisbon, Portugal in November 2017, brought together 1.300 participants from 89 countries around the world, including health professionals, patient advocates and journalists. We believe that health professionals working closely together with patient advocates and with the strong support of the media can raise awareness about the needs and challenges faced by this traditionally underserved and forgotten group of patients. ABC also aims to identify research priorities based on the most important areas of unmet needs, analyse and discuss available data to provide the most accurate management recommendations, as well as influence policy makers and funding bodies and ultimately improve standards of care, survival and quality of life. Research and education, with accurate usage of available knowledge, throughout the world, are key to achieve these goals. The creation of the Global MBC Alliance, also provides a platform for the development of important projects, aiming to strongly impact on the survival and quality of life of advanced breast cancer patients. ABC guidelines are jointly developed by ESO (European School of Oncology) and ESMO (European Society of Medical Oncology) and guidelines or ABC conferences have been endorsed and supported by several other international oncology organizations such as EUSOMA (European Society of Breast Cancer Specialists), ESTRO (European Society for Radiotherapy and Oncology), ESGO (European Society of Gynaecological Oncology), UICC (Union International Contre le Cancer), SIS (Senologic International Society) / ISS (International School of Senology), FLAM (Federacion Latino-Americana de Mastologia), OECI (Organization of European Cancer Institutes), EONS (European Oncology Nursing Society), AGO (Arbeitsgemeinschaft Gynäkologische Onkologie e. V.), Susan G. Komen® and BCRF (Breast Cancer Research Foundation), and have official representation from ASCO. It is therefore with great enthusiasm that we invite you to attend the Advanced Breast Cancer Fifth ESO-ESMO International Consensus Conference (ABC5) that will take place in Lisbon, Portugal, on 14-16 November 2019. Together we will improve the lives of all brave ABC patients. 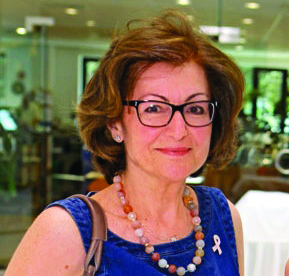 Evi Papadopoulos, a passionate and dedicated patient advocate, one of the founders of Europa Donna Cyprus and an advanced breast cancer patient who strongly believed in and supported the ABC Consensus Conferences serving in its committee from the beginning.